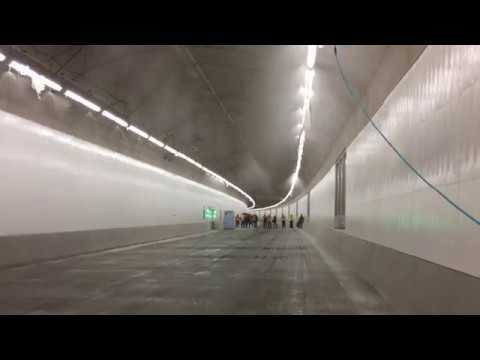 Testing fire systems inside the SR 99 tunnel, June 28, 2018 marked the first test of deluge sprinkler system inside Seattle’s SR 99 tunnel. In this two-minute test, 6,400 gallons of water poured out of the overhead sprinklers. There are 208 fire safety zones inside the two-mile-long double-deck road tunnel. This particular test spanned two fire safety zones – a section of 216 feet. There are many more tests ahead before the tunnel is finished. The Alaskan Way Viaduct replacement tunnel, also known as the SR 99 Tunnel, is a bored highway tunnel in the city of Seattle, Washington, United States. The 2-mile (3.2 km), double-decker tunnel carries a section of State Route 99 (SR 99) under Downtown Seattle from SoDo in the south to South Lake Union in the north. Since the 2001 Nisqually earthquake, the replacement of the Alaskan Way Viaduct has been the source of much political controversy demonstrating the Seattle process. Options for replacing the viaduct, which carries 110,000 vehicles per day, included either replacing it with a cut-and-cover tunnel, replacing it with another elevated highway, or eliminating it while modifying other surface streets and public transportation. The current plan emerged in 2009 when government officials agreed to a deep-bore tunnel.